I built Emsingen station matching the plan I had laid out months ago but with a 3 track yard, instead of the two track version I planned for in October. The supports are in, cork roadbed is installed in all areas that are settled. I laid out track everywhere, but didn't fasten it yet. Also, no track feeders or switch machines are installed. The main purpose right now is to see whether the track arrangement "works". Here is the right hand side (or east side) of Emsingen with the loading ramp. The steamer is standing on the yard arrival/departure track near the run-around / team track. Today I tried actual switching moves with a train arriving on the arrival/departure track in Emsingen. 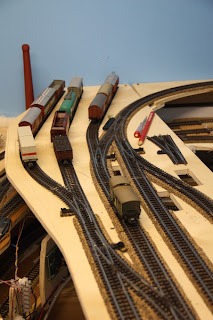 I quickly realized that the access switch to the yard tracks as planned is too far in the middle of the arrival track to allow for any satisfactory switching without fouling the main track. The solution was to move the switch for the yard track closest to the main to the arrival track, so that the yard track becomes an extension of the arrival track (see picture left, the green car in the front is on the arrival/departure track). This way I can take a 9-10 car train, and if needed, back the whole train into the extension track on either side of the arrival track. 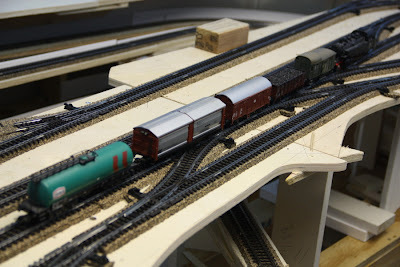 During switching moves this trackage can hold up to 8 cars. 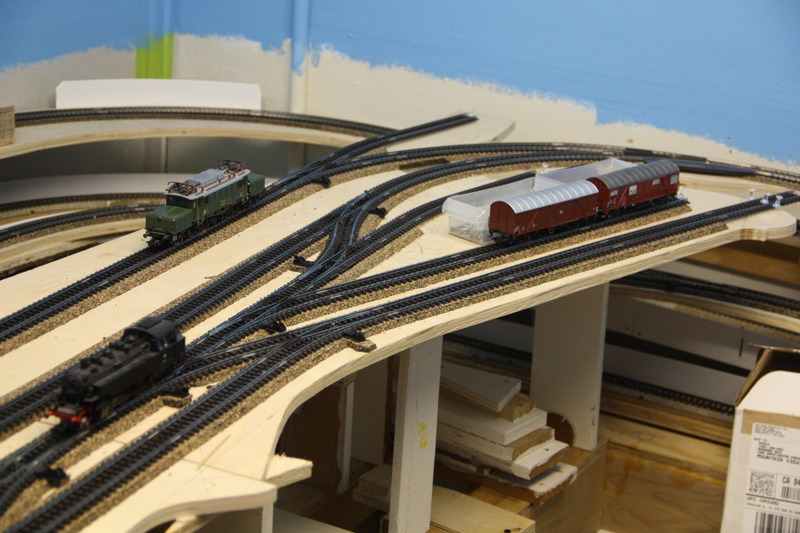 Regular storage capacity is 3 cars with the other two tracks holding about 4 cars. Typical train length for switching in Talheim is 4-5 cars. Maximum train length for meets in Emsingen is 9-10 freight cars, or 4 passenger cars. Yes, train lengths on this layout are rather paltry compared to many US layouts. Here is Ng 34724 getting ready to leave Emsingen from the arrival/departure track for Talheim.